Last year’s runners-up Sunrisers Hyderabad (SRH) will be looking to go one step further and clinch their second Indian Premier League (IPL) title. Sunrisers have a good record in IPL. Ever since replacing Deccan Chargers, the Hyderabad-based franchise has qualified for playoffs four out of six teams, including the title win in 2016 edition of IPL. Meanwhile, if you are SRH fan and want to watch live online streaming of their matches, then you below we have listed all the information on how to watch the live stream of IPL 2019 SRH matches. KKR Squad in IPL 2019: Team Profile, Schedule of Kolkata Knight Riders in VIVO Indian Premier League 12. Sunrisers Hyderabad’s IPL 2019 campaign opens with an away match against Kolkata Knight Riders (KKR) on March 24. 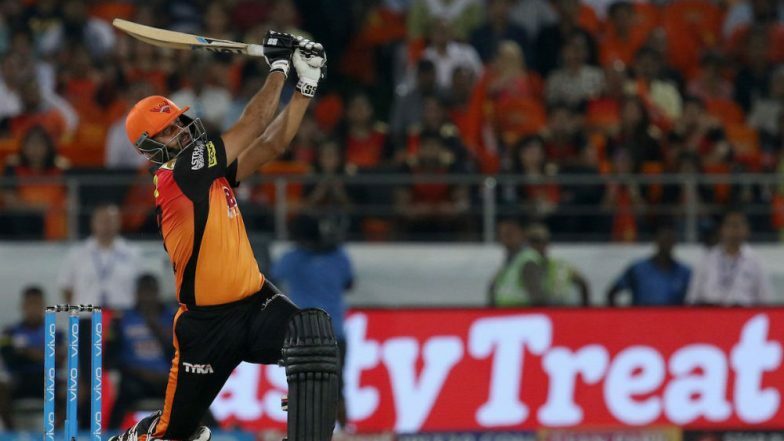 SRH will then return to their home venue Rajiv Gandhi International Cricket Stadium in Hyderabad to play their first home game against Rajasthan Royals (RR) on March 29. Team KKR New Players: Here’s a Look at Upcoming Talent in Kolkata Knight Riders Squad for IPL 2019. Sunrisers will play their last league stage match on May 04 against Royal Challengers Bangalore (RCB). It will be an away fixture. From April 14 to 21, SRH will play three back to back home matches. Kolkata Knight Riders Tickets for IPL 2019 Online: Price, Match Dates and Home Game Details of KKR in Indian Premier League 12. Star Sports Network holds the official broadcasting rights of IPL 2019. So, its OTT (Over the top) platform, Hotstar, will live stream the IPL matches. For IPL 2019 live score, points table and schedule, SRH fans can click here. SRH fans can catch the live action on hotstar’s mobile application and official website. JIO users can watch IPL matches for free on their devices via hotstar app.